You are at the #1 premier website to view and obtain the best homeowners insurance in Florida from one of the top 37 Florida homeowners insurance companies. These companies offer the most competitive and comprehensive homeowners insurance rates Florida. 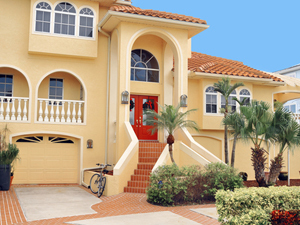 Get your customized homeowner insurance quotes Florida now! It only makes sense to insure your home in light of so many natural disasters that are happening around the world. And, if you love your Florida home, then it is time to look for some good homeowners insurance in Florida. Your hard earned investment might get swept away in just a short time due to flooding, hurricanes and even storms, especially in our State. Before you know it, you will regret not having your home insured and bear all the losses that could lead to financial breakdowns. We protect you from this happening. It is important to have sufficient coverage on your home to help you cope with losses should it occur. You can find this valuable coverage here and you will notice that we offer various homeowner insurance quotes Florida. Please fill out the answers to the following questions, we'll then have enough information to provide you an accurate proposal. Broad Form (HO-2)- this type of insurance coverage coves all types of perils including but not limited to the following: windstorm or hail, volcanic eruptions vandalism, smoke, fire or lightening, falling objects, explosion, and many more. These are natural disasters known as the acts of God or nature. Modified Coverage Form (HO-8)-This is the type of insurance that is limited in its scope and insures your home against only windstorm or hail, volcanic eruption, vehicles, vandalism or malicious mischief, theft, smoke, riot or civil commotion, fire or lightening, explosion, and aircraft. Special Form (HO-3)-This is the most sought after coverage offered by Florida homeowners insurance companies that cover all types of perils and anything else that is not specially excluded in the insurance policy. Take note that according to Florida Law, homeowners insurance in Florida must also include a provision on sinkhole damage. To make sure that you are covered, talk us about it at 352-200-2066. You can get an online quote for a low rate here that will also include other types of insurance coverage such as coverage for some items like pieces of jewelry that are stolen, and additional coverage for other valuable items in your home. We offer you carrier comparisons when it comes to protection and rates and you will see which Florida homeowners insurance companies offer the best deals, packages and even discounted rates. Remember that not all that is cheap is the best coverage. Make sure that you have scrutinized the quote being offered from other agencies before you grab it. We can identify any bad quotes in seconds! Protect your lifelong investment with the best homeowners insurance in Florida by checking with us today.